This Outdoor Saturday is a bit of a look back. Jacob Lazare tackles the NHL 100 Classic in hindsight with the jerseys he thinks the teams should’ve worn. Navy blue seems to be the accidental theme of the week. 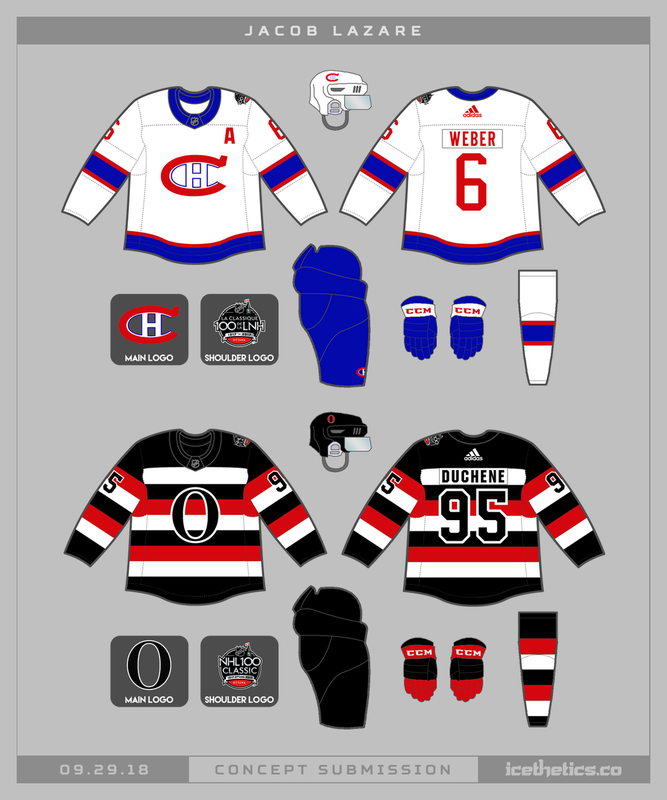 We'll rectify that tomorrow, but in the meantime check out this third jersey overhaul by Jacob Lazare. Maybe something the Blues could sport next season? Today's entry is nothing to freak out about. However — you might find it a little freaky that Jacob Lazare designed this rather spot on Predators set nearly three months before the new design was revealed. Is he psychic? Could his white jersey be a clue to what we might see later this summer? I've set it before. Fixing the Ottawa Senators' uniforms is not a difficult task. Jacob Lazare demonstrates that fact once again with today's entry. Jacob Lazare puts Florida's new pouncing Panther to good use in this third jersey.